The Canon EF 50mm f/2.5 Macro Lens is Canon's shortest (in both focal length and physical length) macro lens. Although designated and classified as a macro lens, the 50 macro natively offers only 1:2 (.5x) magnification (vs. 1:1 (1x) in most true macro lenses). Coupled with the expensive (it costs about as much as the lens itself) optional accessory Canon Life Size Converter EF, the 50 macro can focus down to 1:1 lifesize. Build quality for the 50 macro is mid-level for Canon. The mount is metal - the focus ring is a bit loose. The front element extends a bit during focusing but does not rotate. 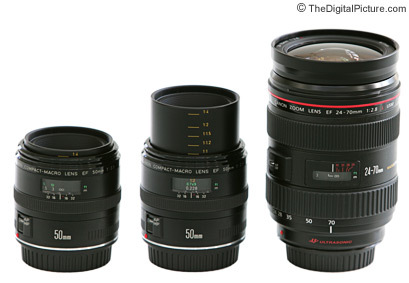 Pictured above from left to right are the 50 macro, the 50 macro extended and the Canon 24-70mm f/2.8L USM Lens. The Canon EF 50mm f/2.5 Macro Lens does not feature USM (Ultrasonic Motor) focusing. The result is somewhat noisy and medium-fast focusing. FTM focusing is not part of the feature set. Canon does not provide a lens hood for the 50 macro, but it is not so important for this lens as the front element is recessed deep into the lens. As it is, the 50 macro shows good resistance to flare. Distortion is very well controlled even with close subjects (important in a macro lens). The Canon EF 50mm f/2.5 Macro Lens is very slightly soft wide open, sharp at f/3.2 and very sharp after f/4-5.6. Color and contrast are very good. Full frame body users will see some vignetting wide open. In addition to macro application use, the 50 macro can be used as a normal 50mm lens. Compared to Canon's other 50mm lenses, the 50 macro is slightly longer/narrower/lighter than the Canon EF 50mm f/1.4 USM Lens, and both are larger/heavier/have better bokeh quality than the Canon EF 50mm f/1.8 II Lens. The 50 macro has a 6-blade aperture while the 50 f/1.4 has an 8-blade aperture. If you are in the market for a 50mm normal lens, my personal recommendation is to spend a little more money and get the Canon EF 50mm f/1.4 USM Lens. I think the additional f-stops (nearly 2) the f/1.4 lens provides are very worthwhile and add versatility to your 50mm. The f/1.4's somewhat better (slightly faster, quieter) focusing motor is worth something to me as well. If you are in the market for a macro lens, I recommend the Canon EF 100mm f/2.8 USM Macro Lens. The extra working distance this lens affords is very nice. Of course, the Canon EF 180mm f/3.5L USM Macro Lens is really nice if your budget can handle it. 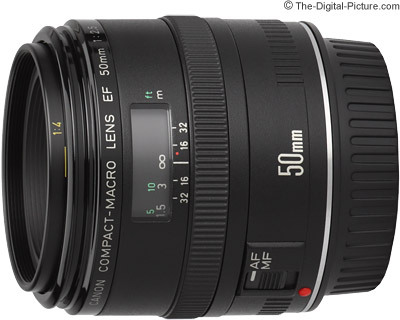 If you need both (50mm normal and macro) in one lens - the Canon EF 50mm f/2.5 Macro Lens is for you! If 1:2 macro is good enough, the 50 macro is a good value lens. Image quality is very good. There are many uses for this lens, but semi-close-up photography is a good candidate. Product photography is one example. Small non-living items such as jewelry, fashion accessories, documents ... are more examples.